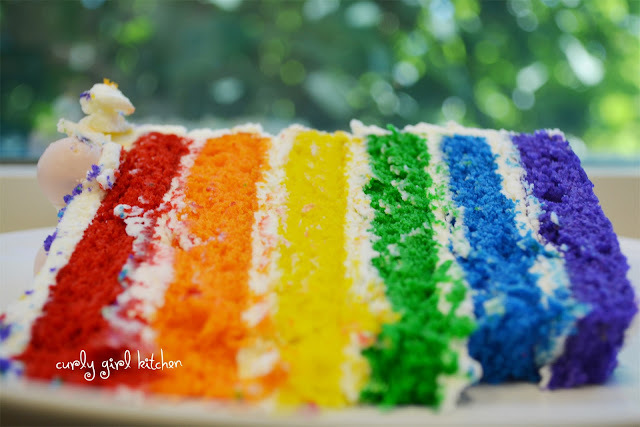 It was my coworker April's birthday this week, and I have been waiting for a reason to make a beautiful rainbow cake, and since "April showers bring May flowers" ... and Rainbows!, well, it seemed appropriate, don't you think? Since I was going to take the cake in to work, and I thought it only right that April get to cut the first piece, I knew I wouldn't be taking a carefully styled photo of the cut cake at home. So I decided to turn this post into a little bit of a tutorial, focusing more on the process so you can see the inside of the cake throughout the preparation, rather than just the finished product. Luckily, I was able to snap a few quick photos of the cake at work, too, after it was cut, which I thought turned out really pretty after all, sitting on the windowsill next to my desk. I don't often take photos of the baking process, for several reasons. For one thing, we have no natural light in our kitchen, so it's impossible to take a decent photo in the kitchen where I'm working. I take all of my photos in a small room off our living room, which has two windows providing some natural light, although not as much as I would like - if I could only have a way to do photo shoots outdoors (but sadly, we have no back yard) - as well as a desk where I can keep everything set up and not worry about the clutter. 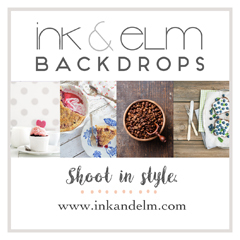 So as you can imagine, it's a little bit of a hassle to carry everything back and forth from the kitchen, through the living room, and into what used to be an office/sewing room but has evolved into my photography shoot room, in order to take photos of each step. But the other reason is that unless the step-by-step photos are providing a visual explanation of something that's confusing or difficult, such as how the color of caramel changes as you cook it or what "stiff peaks" of meringue should look like, I don't find them all that necessary. Most people know what butter and sugar look like after they've been beaten together. And what what it looks like when the eggs have been cracked into the bowl. Then the vanilla. Then the flour mixture. And the milk. You get my point. 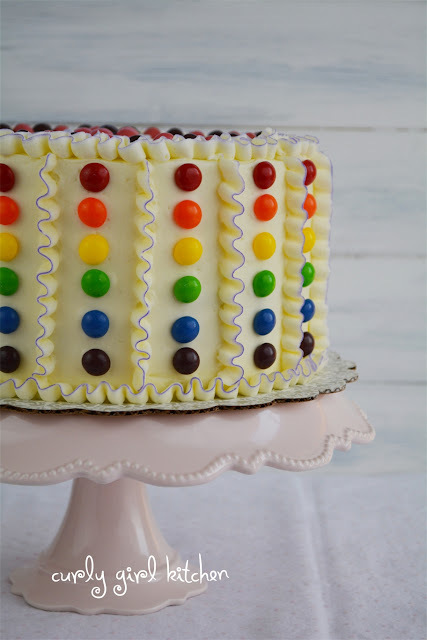 Not to offend those of you who like seeing pictures of those steps, but these types of "tutorials" just annoy me, because I don't consider them to be tutorials at all, and they create too much distraction from the actual recipe and the cake, cupcakes, pie, or whatever it is you've worked to make tasty and attractive. 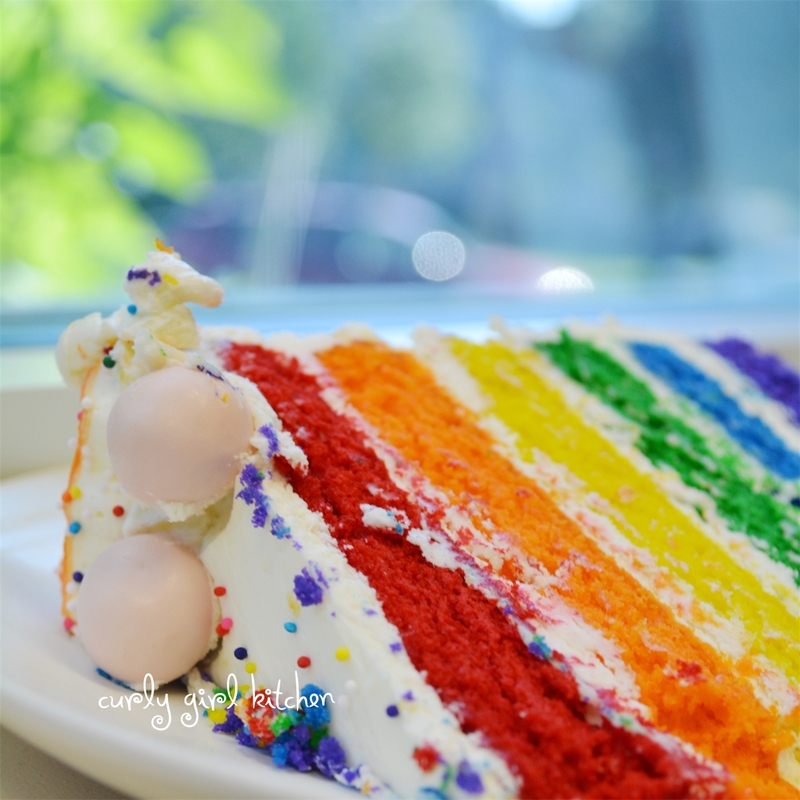 Knowing how to crumb-coat a cake is an essential step in creating a smooth foundation for the shape and structure of a cake, and something that everyone who bakes cakes should know how to do. The striping is just a fun little technique I like to use, when I want to add a little color, without adding too much color all over. 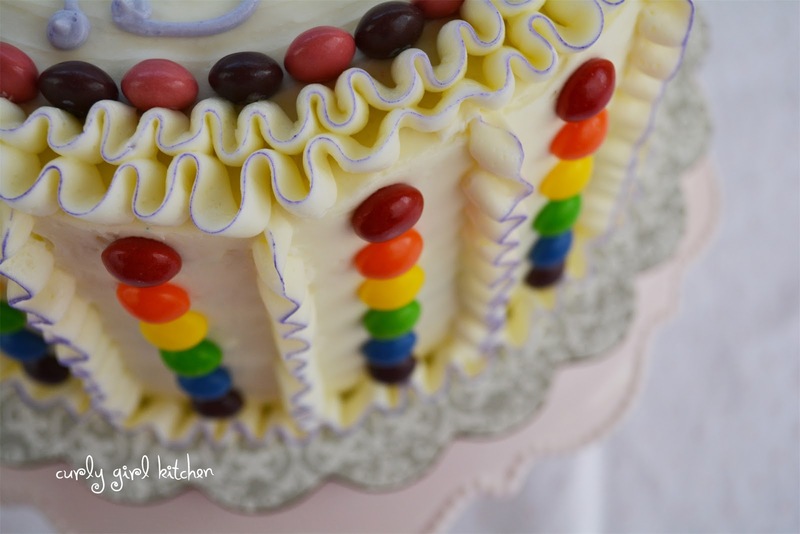 So to get started, you will of course need your cake, baked and cooled, and your prepared buttercream. For a previous post on Everything I've Learned About Buttercream, please click Here. Until this week I only owned three 8-inch round cake pans (with the tall 3-inch high sides I like), but I took this opportunity to buy three more, so I would have six pans total. I often bake more than one cake at once, so it was necessary for me to have more pans at my disposal, but if you don't think you would often have need for so many pans all at once, then just bake the layers in batches. To spread out the work for this cake a little, I mixed the batter, colored it and baked the cake layers on Sunday night, and then frosted and decorated it Monday night, in order to take it to work on Tuesday. I always cool layer cakes completely in the pans, sitting on top of a wire rack, covered loosely with a clean kitchen towel, to keep the moisture in and prevent them from drying out as they cool. Once cooled, I would usually begin frosting and decorating the cake immediately, but since I planned on waiting until the next day for that, I turned the cakes out of the pans and stacked them on a parchment paper-lined baking sheet, with a piece of parchment between each cake so they wouldn't stick together (photo above - Example A.). Then I covered the stack with plastic wrap to keep it airtight until the next day. As you can see, I stacked them in reverse order, with purple at the top, so that when I was ready to assemble the cake, all the layers were in the correct order so that the first cake used (purple) would be at the bottom with the last one (red) at the top. 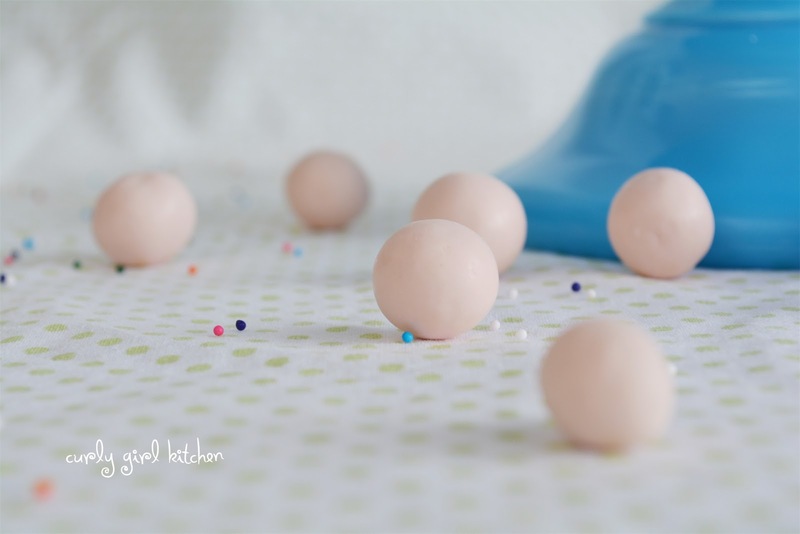 If your cakes need to leveled - and they absolutely do if they bake with a rounded top - level that rounded portion off with a sharp knife before stacking or assembling (and then make cake pops from those scraps you slice off). Stacking rounded cakes on top of each other will only create a lumpy, uneven cake with huge gaps around the edges of the layers, and the upper layers will likely crack right down the middle since they don't have a flat base to sit on. Believe me, I've learned this from experience. If they're slightly sunken in the middle, this isn't a big deal, and I either just fill the indentation in with a little extra frosting or scrap of cake, or level them around the raised edges instead of the middle. 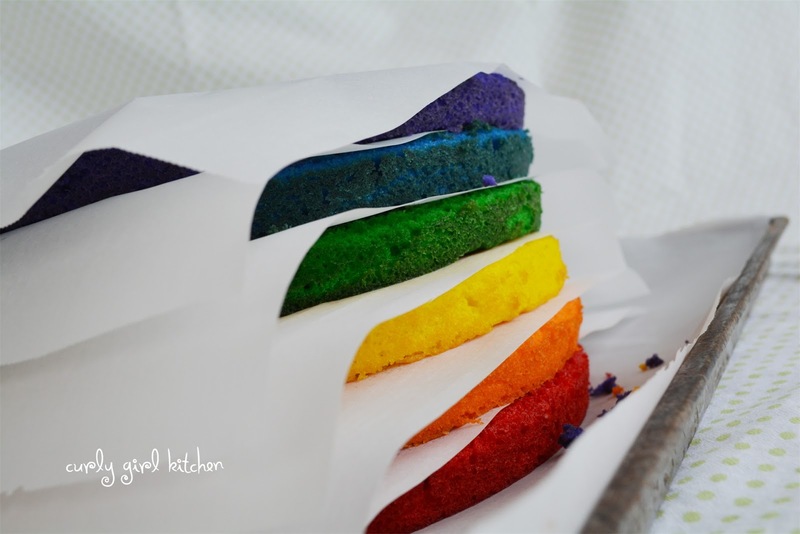 The recipe (provided at the end of this post) I used for this rainbow cake is actually one I adapted from my pound cake recipe, and it bakes very even and flat, with no need for leveling, which is exactly why I used it for this design, what with stacking six layers and all. It's also worth mentioning the use of parchment paper inside the cake pans. When I started getting serious about cake baking, I always traced and cut circles of parchment to place inside every cake pan, as well as spraying non-stick spray under and on top of the paper before pouring in the batter. Since then, I've stopped this practice since I was going through so much paper and hated cutting out the circles, and I've never had a cake stick from the use of non-stick spray alone. 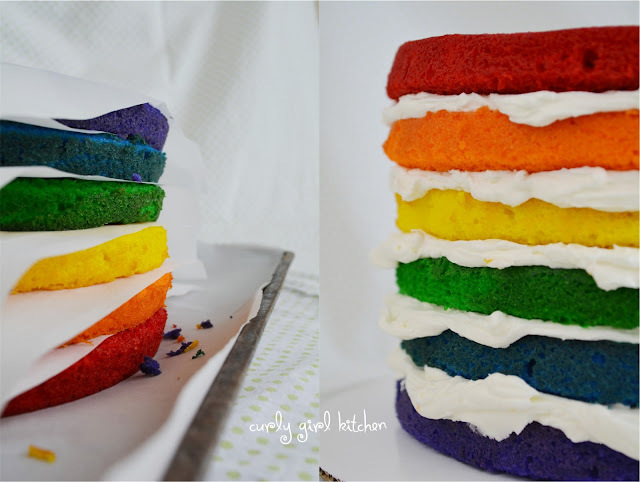 So before crumb-coating your cake, of course, the layers need to be filled and stacked. Just plop a spoonful of frosting in the middle of the first layer and use a flexible icing spatula to spread it out to the edges, letting it droop over the sides a little. I try to keep the frosting between the layers fairly thin, between 1/8 - 1/4 of an inch thick. 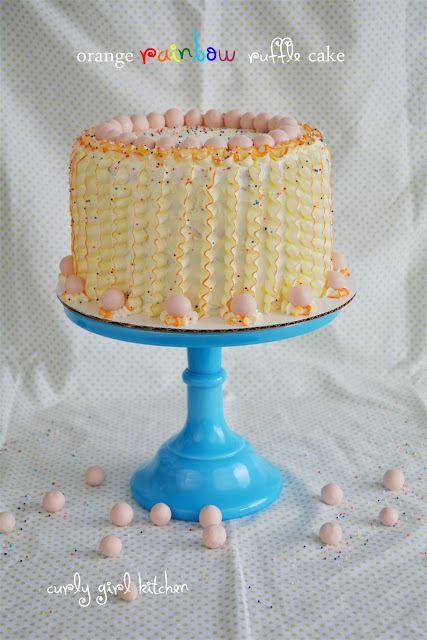 With this many layers of cake, you don't want people to be overwhelmed with too much rich buttercream inside the cake. 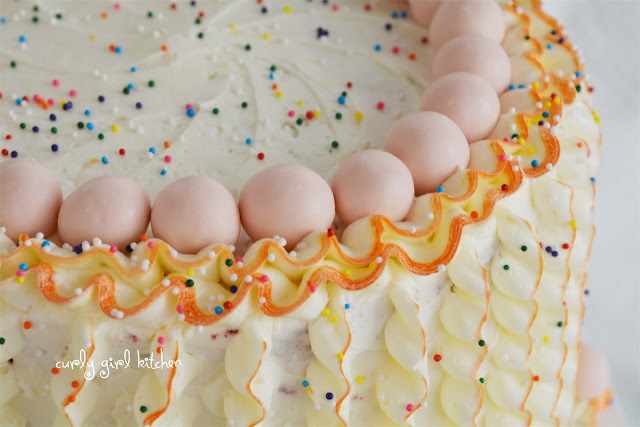 The consistency of the buttercream is important - too thin and soft and the cake layers will slide around and you'll end up with an uneven cake that leans to one side or the other. Too thick and dry, and you risk tearing the cake as you spread the buttercream. Practice until you find a consistency that works best for you. Continue stacking and filling the cakes, being careful to center each layer as you go, so that your cake is nice and even. Once I have the top layer on, I always always take a wooden skewer, stand it next to the cake, and cut it to the same height as the cake. Then I stick it straight down the center so that the sharp, pointed end pokes securely into the cake board at the bottom. This provides additional support to the cake, and helps immensely with keeping the layers from sliding around as you frost the sides of the cake. 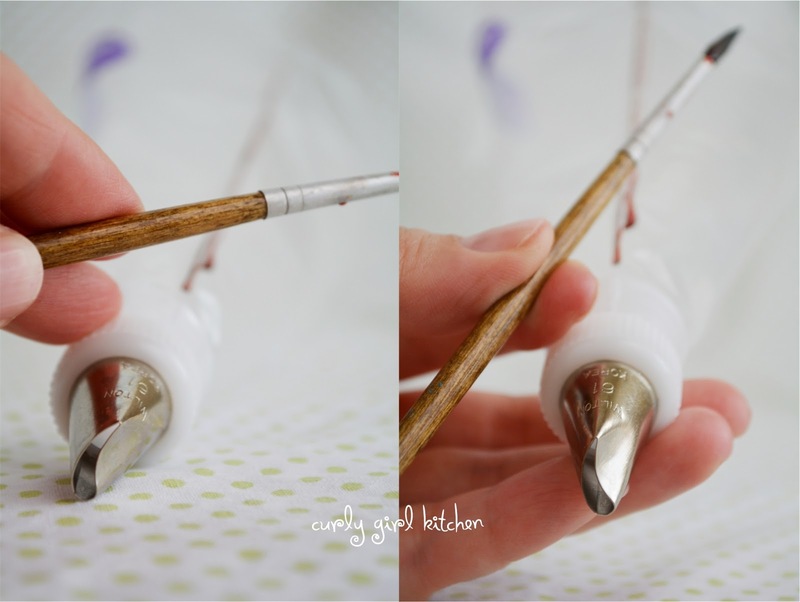 A lot of people use bubble tea straws for this purpose, as well as to support tiered cakes. Now is the time to frost the cake with the crumb coat. Usually, the excess frosting that's drooped over the edges of each layer is enough for the crumb coat, with a little more from the bowl to cover the top, since the crumb coat is a very thin coat of frosting. As you see in the photo above (Example B. ), it is far from pretty or perfect, and its function is simply to hold all the crumbs in so that they don't end up in the frosting that everyone will see, as well as to shape straight, smooth sides and top edge. After frosting the cake with the crumb coat, refrigerate the cake for 20-30 minutes to let the crumb coat firm up and crust over slightly. 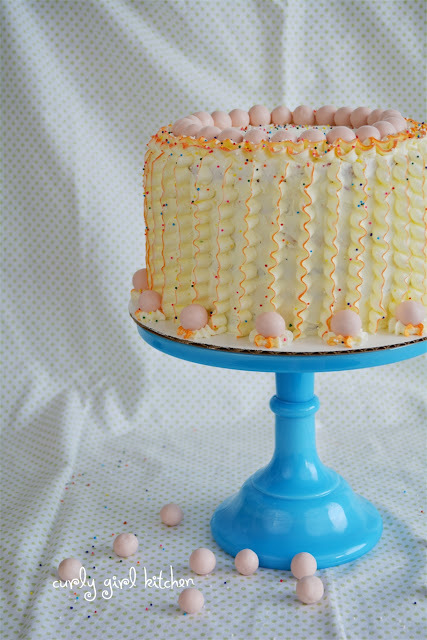 Frost the cake with a final "pretty" layer of buttercream using your flexible icing spatula. Pipe on a design that will cover the crumb coat completely, such as the popular rosette technique shown here, here and here. Simply pipe your design onto the cake, and the crumb coat will be all covered up by all the rosettes and swirls. Frost the cake with what I'm calling my second crumb coat, before piping on a design. I'm calling this a second crumb coat because as you see (photo above, Example D.), this is giving the cake more coverage than the first crumb coat, but this is still not a finished job. It's a little rough, and you can still see some dark areas where the cake is showing through. But the cake is essentially covered up and it doesn't need to be perfectly smooth for the ruffles that I wanted to pipe over it. 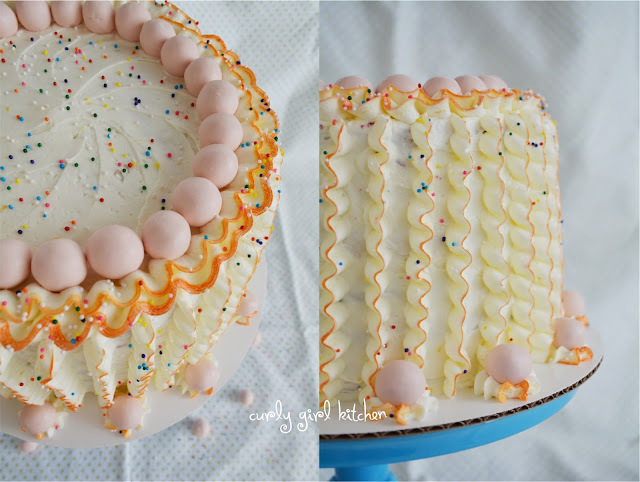 In hindsight, I would have made this coat slightly thicker, since there were a few areas that I thought showed through the rows of ruffles (which don't provide a ton of coverage), but with all the sprinkles on the cake, those areas were hardly noticeable. At this point, I frosted the top of the cake with its finished look (photo below, Example E.), a simple swirl pattern with my flexible icing knife, beginning at the edges and sweeping the knife towards the middle. I was not worried about the edge looking perfect, since I planned to cover that with ruffles. 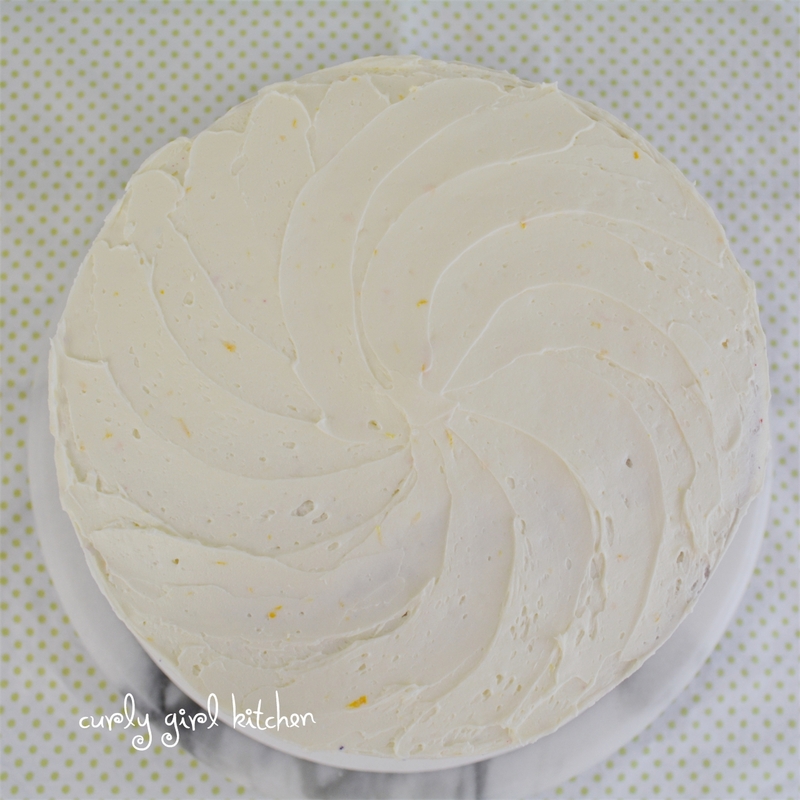 And by the way, the flecks you see in the frosting here are not crumbs, but actually fresh orange zest. Now let's talk about the ruffles. 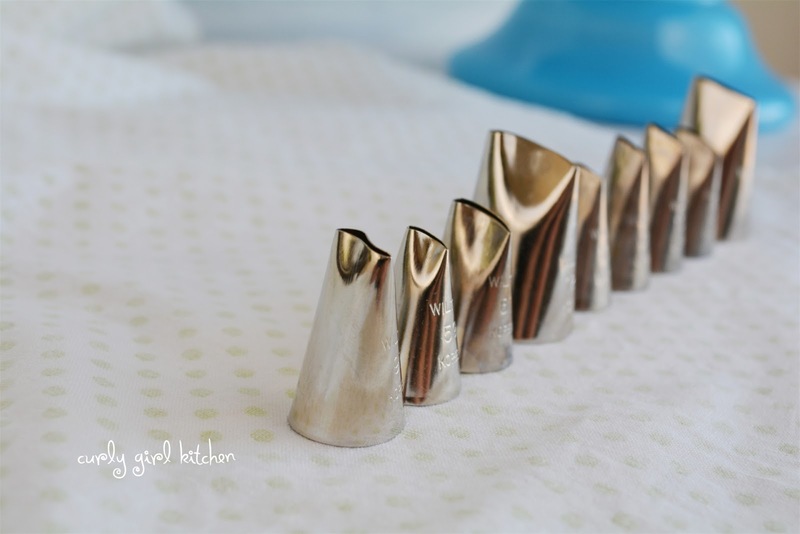 I know that they do make "ruffle tips" specifically for pretty ruffly designs; I'd love to buy a few of those, but have yet to do so, so I use the "rose" tips, with one edge wider than the other edge. 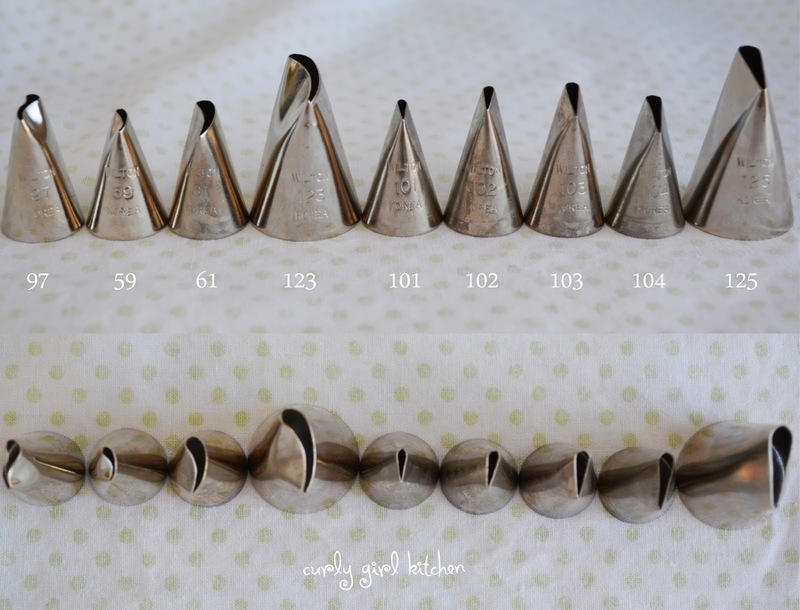 Similar to the rose tips are the "wavy" tips (I have no idea what the official term is for them), and I have a few of those in my tip kit. I've always used the rose tips before, but this time decided to try one of the wavy tips (specifically #61). I thought the results appeared very similar to my technique on this 4th of July Cake where I piped the ruffles with a rose tip. If you haven't piped ruffles before, they're very easy. 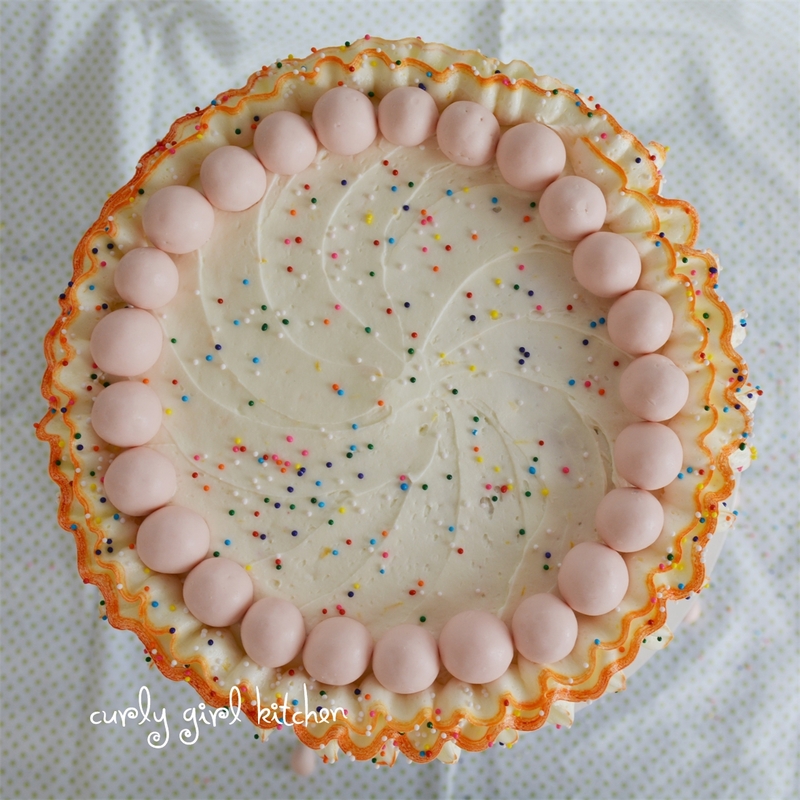 Practice on a cutting board or piece of paper to get the hang of it, but you simply hold the wide end against the cake with the narrow end pointed out (at a 90 degree angle from the cake) and pipe a row of buttercream, wiggling your hand slightly to create the ruffly line. Different sized tips will result in different looks; I usually use the smaller ones, but one of these days I'll get brave and use the #125 to create really big, dramatic ruffles. 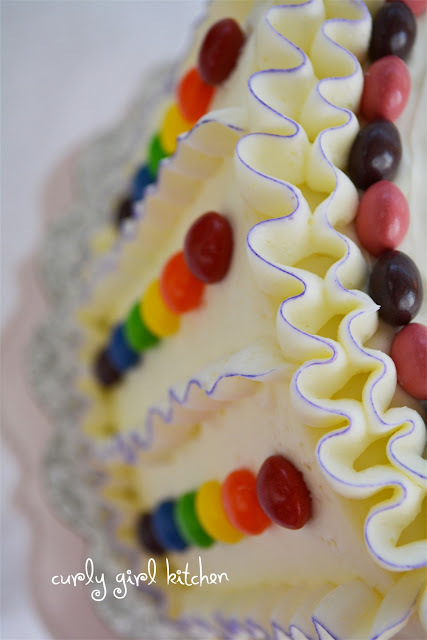 To add a stripe of color along the edge of the ruffle is simpler than you might think if you've never tried it. Make sure that the narrow edge of the tip is lined up with one of the seams of the piping bag before you tighten the coupler. 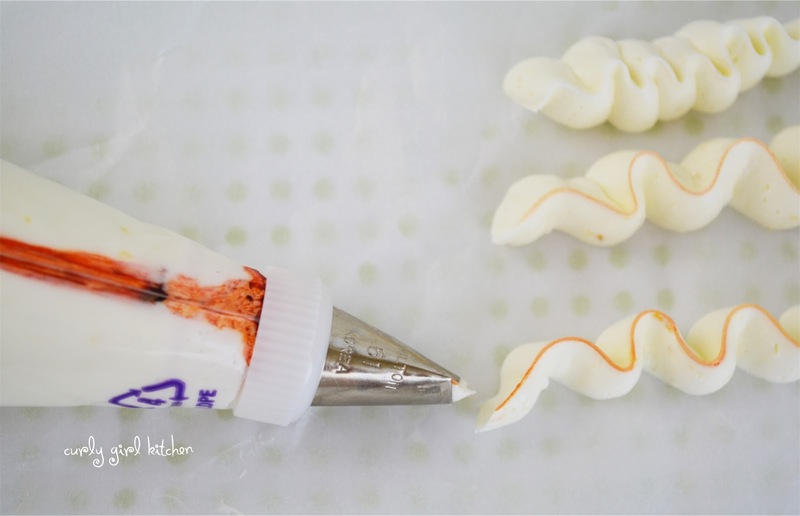 Dip a clean, small paintbrush into your food coloring and paint a thin stripe of color up the inside of the piping bag. Carefully fill your bag with buttercream so you don't smear the color all over the bag. Squeeze the bag until the buttercream starts to flow with the color at the edge of the ruffle; you'll have to squeeze a little out before the color is picked up. This striped technique can be used with any tip, and looks really pretty for adding a pop of color to the top of cupcakes. Once you've practiced on a cutting board or parchment paper and you're ready to go live on your cake, pipe from the bottom edge to the top edge for vertical ruffles or pipe horizontal ruffles all around the cake (beginning at the bottom and working your way up). Space the ruffles as close together or as far apart as you like. You may need to re-paint the food coloring stripe when you re-fill the bag, if the color starts to get faint. Preheat the oven to 350. Spray the bottoms of 6 eight-inch pans with non-stick baking spray, line with parchment paper, then spray the paper as well. Set aside. In the bowl of your stand mixer fitted with the paddle attachment, beat the sugar, cream cheese and butter on medium speed for 3-4 minutes, until fluffy. Beat in the eggs, one at a time, and the extract. In a separate bowl, combine the flour, salt, baking powder, baking soda and orange zest. Add the flour mixture to the mixing bowl in 3 additions, alternating with the milk, starting and ending with the flour, stirring just until moistened. Divide batter equally between 6 bowls; I scooped a whole cup of batter into each bowl, and then just had a little left to divide evenly. Use the food coloring to color each bowl of batter to the desired shades; be generous with the coloring so that the colors are saturated and vibrant, not pastel. Pour batter into the pans (each color in a separate pan). Bake cakes for 15-16 minutes, until a toothpick inserted in the center comes out clean. Cool completely on a wire rack, covered loosely with a clean kitchen towel. 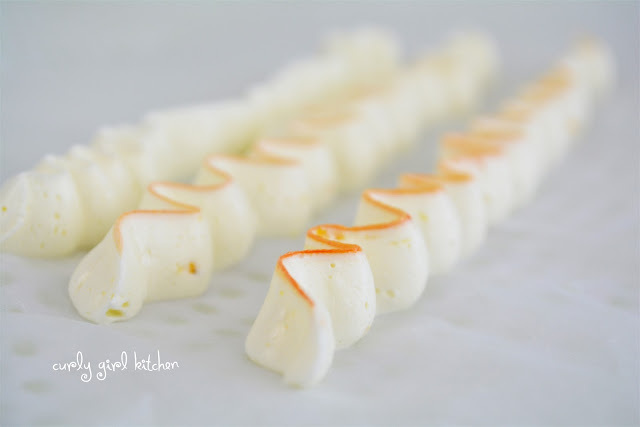 In the bowl of your stand mixer fitted with the whisk attachment, beat the butter and orange zest until smooth. In a separate bowl, combine the powdered sugar and meringue powder. With the mixer on low, add by spoonfuls. Add the milk and increase speed to medium high, whipping until very light and fluffy, about 4-5 minutes. Throughout the beating, taste and add orange extract if it needs additional orange flavor. Scrape the bowl as needed. 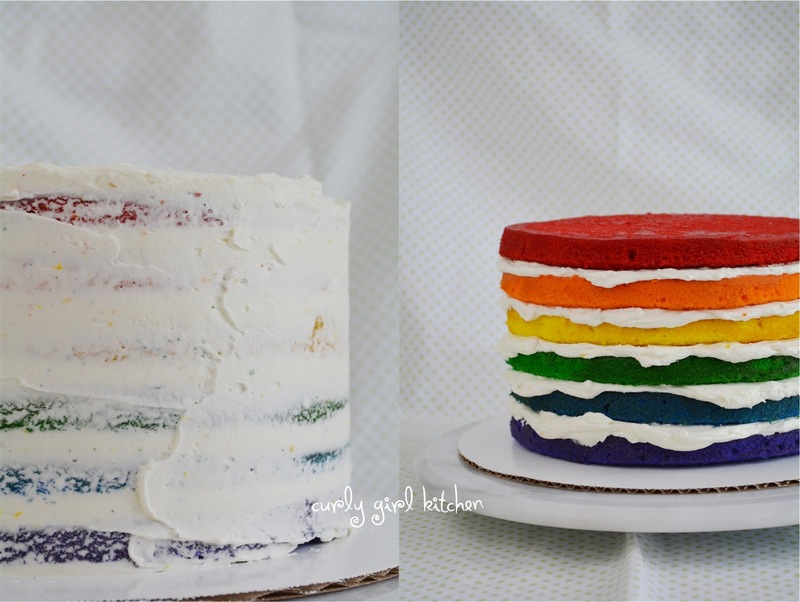 Decide what order you want the colors of the cake layers to be. I stacked mine in traditional rainbow color order - red, orange, yellow, green, blue and purple – from top to bottom, so I started with purple as the bottom layer. 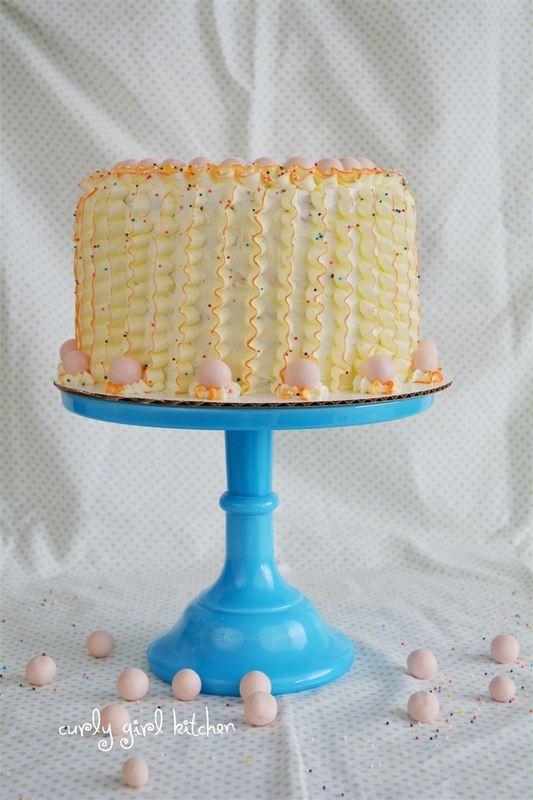 Place the first layer of cake on a serving pedestal or cake board. Spread with a thin layer of the buttercream. 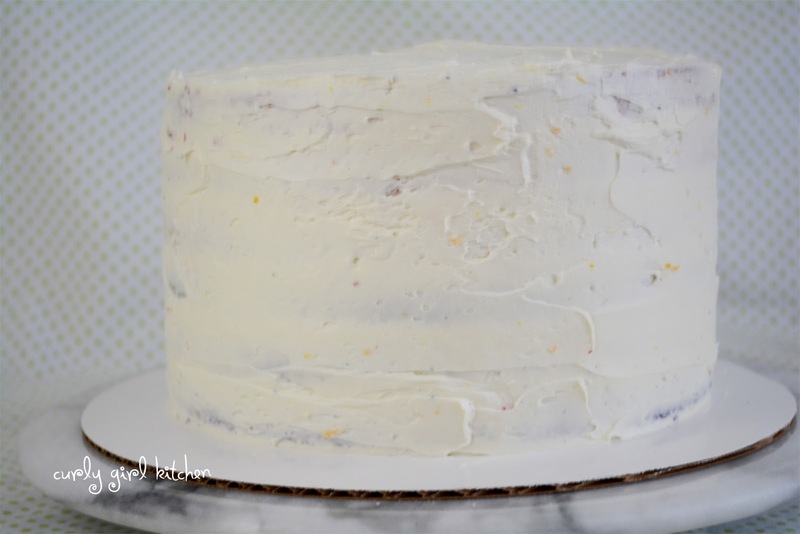 Repeat with the rest of the cake layers, then frost the whole cake in a thin crumb coat of buttercream. Let set in the fridge for 20-30 minutes before frosting with the final layer of buttercream and/or ruffles. Garnish with sprinkles.